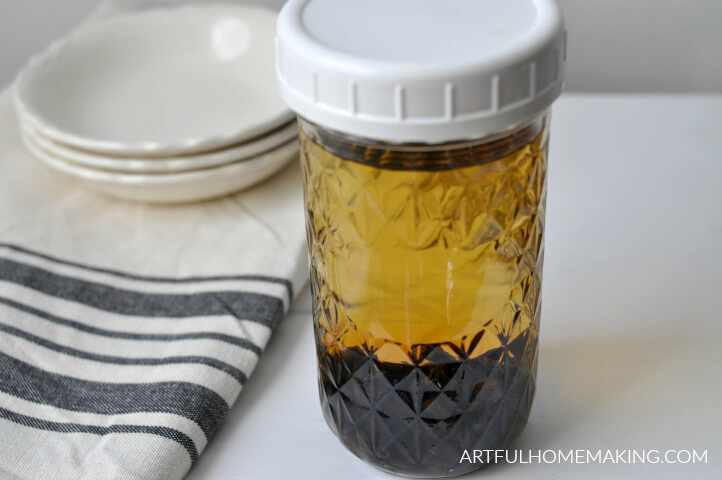 Homemade vanilla extract is so easy to make, and it tastes amazing! This simple DIY tutorial will show you how you can make your own with a few easy steps. I’ve been making homemade vanilla extract for over 10 years now. A friend asked me how I make my vanilla extract, so today I’m going to show you how. It couldn’t be easier! In the years since I started making vanilla, the price of vanilla beans has gone up considerably. However, I still consider homemade vanilla to be superior to what you can find at the store. 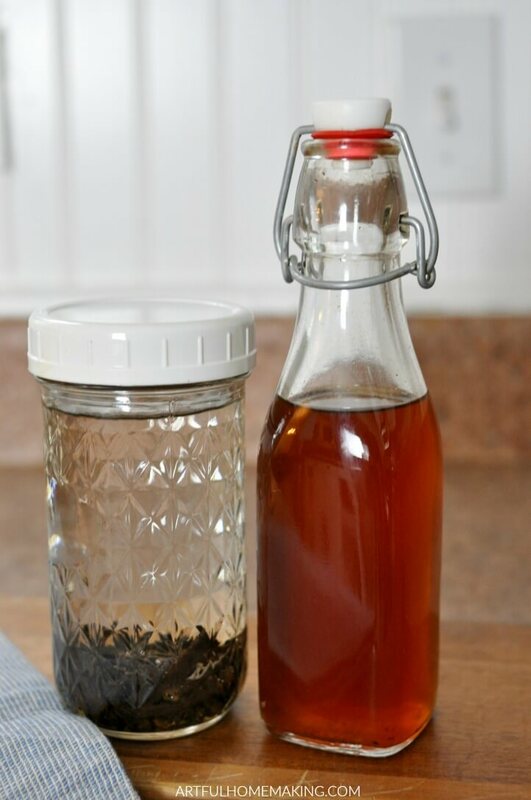 In order to make vanilla extract, you’ll need a few simple ingredients and supplies. 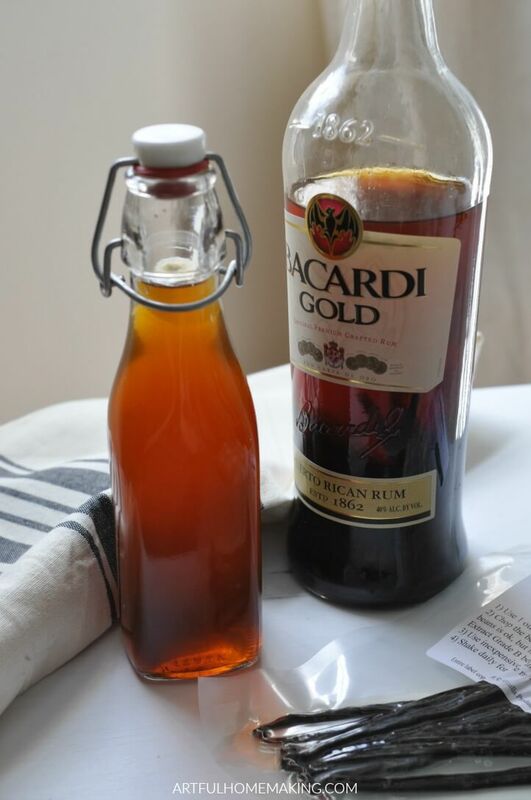 In the past, I always used vodka to make my vanilla extract, but then a friend suggested that I try rum. I decided to put the vanilla beans right in the bottle of rum. This worked out well, and it was very easy, but we all decided we prefer vanilla made with vodka. The rum gives it a different flavor. Not bad, just not our favorite. First, you just need some empty jars, vodka, and vanilla beans. 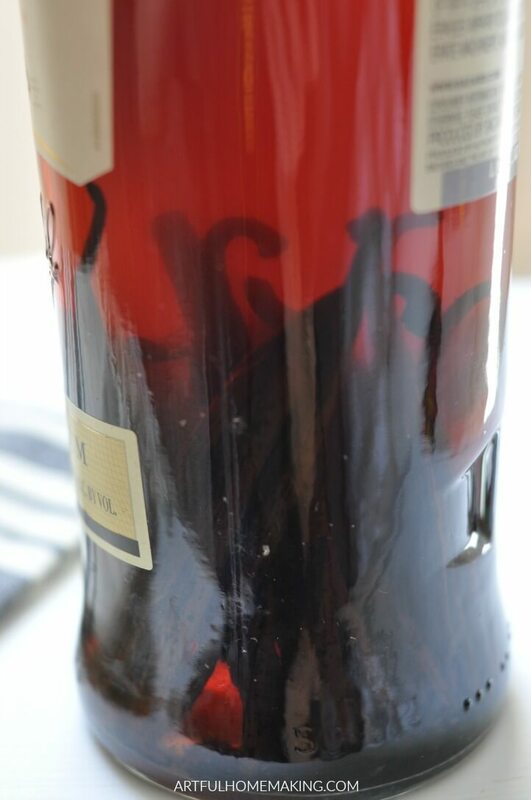 You can also just put the vanilla beans straight into the container of alcohol, like I did in the photo of the rum, above. I use my kitchen scissors to cut lengthwise down each vanilla bean, stopping about an inch from the end. You can also just use a sharp knife, but the scissors are easier, I think. You can also cut the beans smaller than this. Just make sure they stay covered in the alcohol the entire time, with none of the vanilla beans sticking out. So, if you’re using a smaller/shorter container, I would recommend cutting the beans in 1″ pieces. After slicing the beans down the center, put them in a glass jar. I use approximately 1 ounce of beans for every cup (8 ounces) of alcohol. Sometimes I’ve used fewer beans, but this is a general rule of thumb. Add vodka to your jars, leaving enough head space for shaking. Add the lid and shake the jar/bottle to mix everything up. Store the jars tightly closed in a cool, dark place for 4 months or longer. Occasionally give them a good shake. On the left (below), you can see the vanilla I just started, and on the right is some completed vanilla that has been transferred to a flip-top bottle. 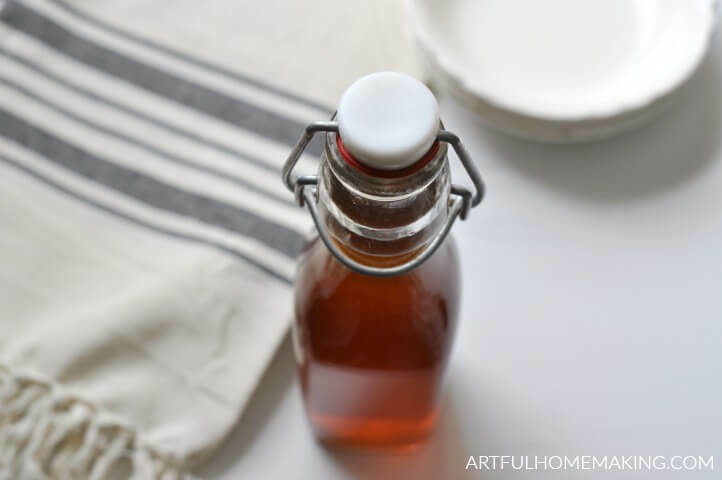 Homemade vanilla extract will last for a very long time in your pantry. 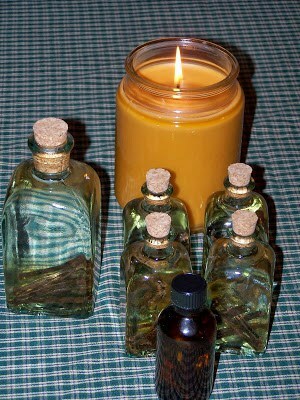 After the vanilla is ready to use, you can also transfer it to more decorative bottles, as I did in the photo below (from several years ago). 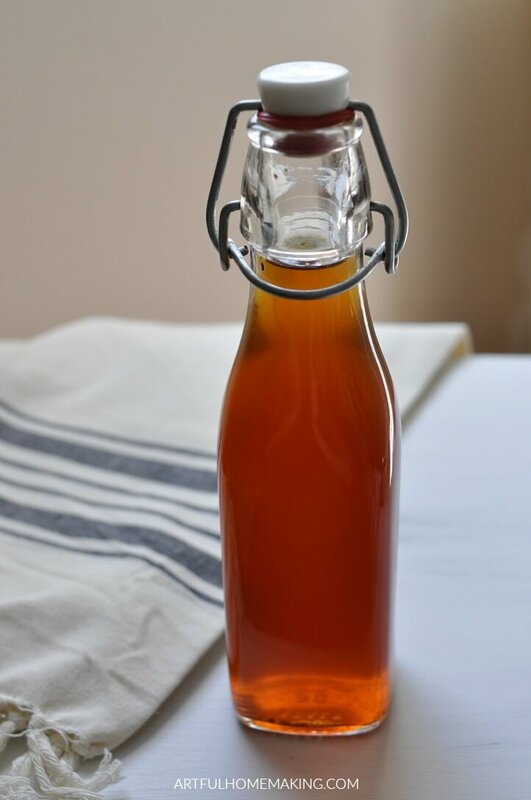 When I made the vanilla below, I simply cut the vanilla beans smaller (into 1″ pieces) and made the vanilla right in the glass bottles with corks. Disclosure: This post contains affiliate links. Read my full disclosure here. Sharing here. Great post. 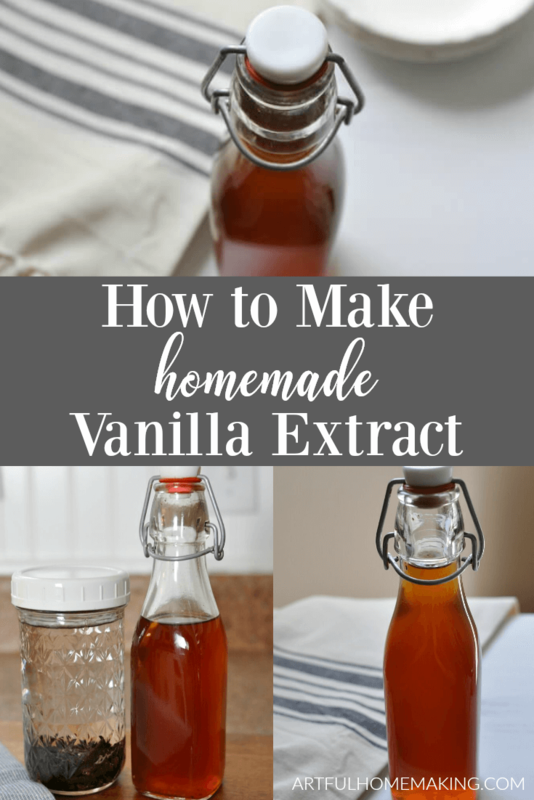 I’ve always wanted to make my own vanilla extract but have been discouraged by the cost of good vanilla beans. I just don’t bake enough for it to be worth it. lol. I’ve always wanted to try making my own extract. Thanks so much for sharing at the #happynowlinkup! It’s so easy! Thanks for hosting! It’s so much fun to make, isn’t it? I really have wanted to try this, so I'm pinning this post! Thanks for visiting, Andrea, and thanks for pinning! I still make all of our vanilla extract. It's so simple and so good! Hello, I'm wondering how you can tell when the Vanilla Extract is ready to use for baking. Also you mentioned that it is best o keep the vanilla in a cool dark place, so would the extract do better being kept in the refrigerator vs in the cupboard at room temperature? I've always heard that the longer you steep it the better the flavor. Some have suggested a minimum of 6 months, but that's not set in stone. When it's dark and has a strong vanilla scent, then I use mine. I think room temperature is best, and there's no need to refrigerate vanilla. It keeps very well in the cupboard or pantry. I keep 1/2 gallon jars of vanilla on the shelves in my basement while they're steeping. Hope that helps! Do you find that using a higher quality vodka (i.e. Smirnoff) makes the vanilla extract better tasting?? I bought vanilla beans via Amazon (the ones you suggested here) and will buy vodka this week to make the vanilla extract. I wasn't sure if the quality of vodka made a difference. I just use whatever my husband brings me, and it always tastes the same to me. 🙂 I'm not sure if the quality would make any difference or not. 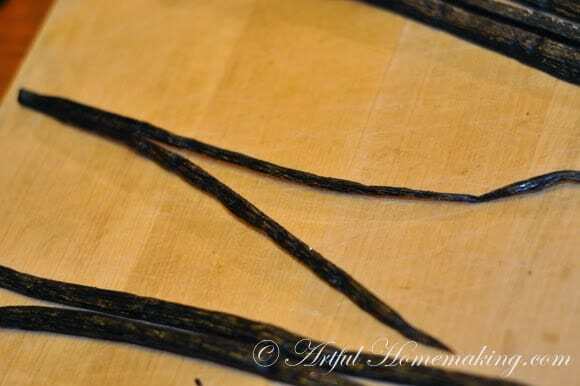 The main purpose of the alcohol is just to extract the vanilla from the vanilla beans, so I think buying high-quality vanilla beans is the most crucial aspect. Hope you enjoy making it! Thanks! I'm exited to make my own vanilla. Thanks so much for leaving a comment, Rachel! I hope you enjoy making it! How fun! I hope you like it! Thanks, Lena! We have been very happy with our vanilla, and I've been making it for several years now. I don't know why the sugar would be necessary, and this works well for us! Thank you Joy! =) Am looking forward to giving the vanilla extract as Christmas presents this year. BTW, I am also a "curly girl", and though my curls are much thinned as I have aged, I still love them. My favorite products are: Curls Rock Shampoo by Tigi, Ouidad Playcurl Volumizing Conditioner, Ouidad's Tress Effects Styling Gel, and a MUST for any curly head, Ouidad's Deep Treatment, which I use twice a year. The Deep Treatment is worth every penny. Though the products can be pricey, I make them last a long time by adding a bit of distilled water to the bottles, and using the products sparingly. I think it's a great idea for Christmas presents! Thank you so much for sharing about your home educated sons. It's always encouraging to hear from those who have walked this path before us. Thanks also for mentioning your favorite curly hair products. I have seen so many great reviews of Ouidad products…it's the price that has held me back from trying them. I did receive a sample of one of the Ouidad styling gels, and I hope to try it soon. That's a great idea to stretch the more expensive products with distilled water–I'll have to try that! I've been using a Jason Biotin shampoo and conditioner (from Vitacost) that I really like. It works so well with my hair. I'm still looking for a gel that I just love. Maybe I'll have to try that Ouidad one you mentioned. Not sure what is wrong with my vanilla. It still has a strong alcohol smell and have been steeping the vanilla since July '11. Have tried adding more vanilla beans and put it into new jar. But still smells so much like vodka. What am I doing wrong? However it is dark in color. ok, thanks for getting back to me. Guess I won't give it another thought. Thank you so much for letting me know that you're planning to make some vanilla! It's such a simple thing to do, and yet it's useful and saves money, too. And thank you so much for following! I'll be coming to visit you soon! I think that I am going to have to try this. (Your pictures make are so great they make the whole process look beautiful! Thank you so much for visiting and leaving such a nice comment, Tara! I think you'll love making vanilla! 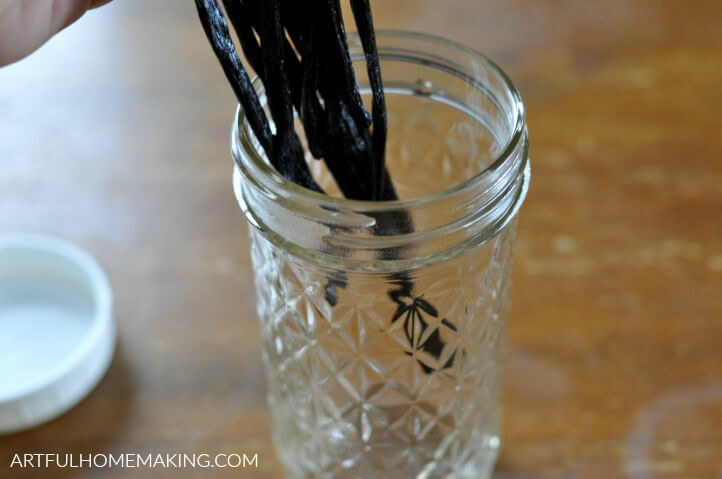 Thanks for the tutorial…I have been wanting to do this for a while now….I am going to check out your link for vanilla beans! I heard about how to do this last year, but never got around to making it. I think I'm going to give it a go this year! It's so easy that I'm sure you'll love it! Yes, that might be interesting to know what people were thinking! 🙂 Thanks for stopping by! It's so fun to make…enjoy! Thank you Joy for the beautiful tutorial. This has always been on my list to try – I have to get brave and go buy the vodka – lol. I have always wanted to know how to do this! Thank you for sharing! I made vanilla extract, starting in December. I used one full bottle of vodka and 15 pods. I found that leaving it for 4 months was best, the taste was far stronger. I plan to make up another bottle to let it sit much longer to strengthen the flavour. It is far nicer than the bought version. Thanks so much for sharing how you make vanilla, Joluise! I think you're right about letting it sit longer and imparting a stronger flavor. I know ours just gets stronger and better the older it gets. And I would agree…it's so much nicer than store bought (as most homemade things seem to be)! Thanks for sharing this. I'm going to try it and it's a great idea to give as gifts. I'll be pinning this post to my Pinterest file. Thanks for sharing.